On December 3, on matchday 12 of the Ukrainian league, the Pitmen faced Karpaty. The Pitmen played postponed Matchday 12 game against Karpaty in Odesa. Compared to the game in Uzhgorod, there were changes to the Pitmen’s starting eleven: Bernard came on for Taison. In August, Shakhtar lost to Dnipro at the Odesa stadium, after that Mircea Lucescu’s team claimed ten league wins in a row to top the league table. The Pitmen started the game energetically and created two goal scoring opportunities in the opening five minutes: Facundo Ferreyra arrived late to get on the end of Ismaily’s cross from the left, and Fred’s shot from the edge of the penalty area flew wide. The first shot on goal was taken by Ferreyra – Karpaty’s goalkeeper parried away the shot. Karpaty responded with a dangerous corner kick, with the Pitmen continuing to pile on pressure. Energetic Ferreyra made a pass into the penalty for Alex Teixeira, who sent his shot over the crossbar. All those episodes took place in the opening 15 minutes of the match. Late on, the game the tempo of the game slowed down. On 27 minutes, Teixeira made a run down the right flank before drilling a cross to the near post for Ferreyra – the Argentine player failed to send the ball in while trying to hold off the challenge from opposition defender. Facundo had a similar chance later as he tried to tap the ball in from the goal line following a deflection but the opposition goalkeeper managed to cover the ball. Then, there was another excellent move involving Bernard and Fred, but Teixeira’s shot from close range was off the mark, and in the next attack Alex failed to bear the opposition goalkeeper following a cross from Ismaily. There was also a long range shot from Fred into the goalkeeper’s hands, but the first half ended goalless. At half time, Eduardo replaced Ferreyra to open the scoring on 56 minutes. The defender and goalkeeper failed to cope with the ball, before it bounced to the centre for Eduardo send the ball competently into the net to make it 1-0. After that, the tempo of the game became higher. Lucescu brought on Dentinho and Viktor Kovalenko. The Pitmen cemented their lead on 85 minutes after an attacking move that saw Eduardo playing the ball into the path of Ismaily for the latter to drill a low shot into the bottom corner of the net to make it 2-0. It was the 22nd goal from the league’s top scorer: Alex’s goal-scoring streak now amounts to ten matches in a row, and he’s getting closer and closer to the club’s record. After a few minutes, the Pitmen extended their lead. Kovalenko intercepted the ball before Eduardo making another goal assist – this time for Teixeira, who struck a shot that hit the goal post and flew into the net – 3-0. 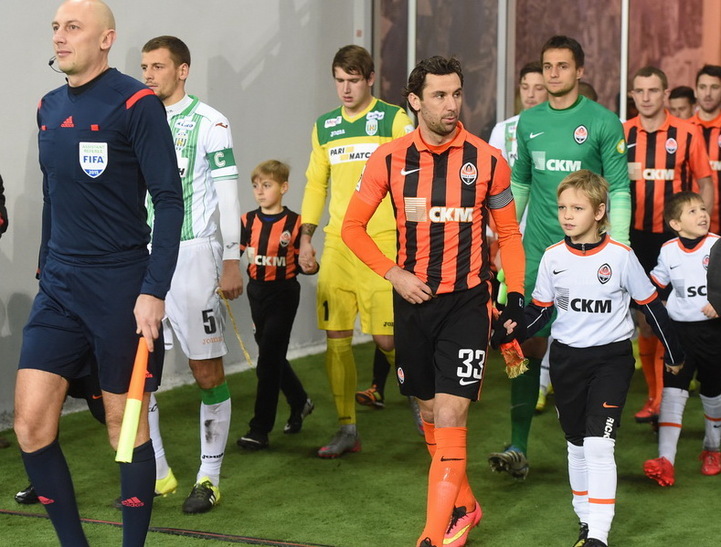 Thus, Shakhtar got their 11th league win, claiming 43 points to go into the winter break in first place. The Pitmen will play their final game of this year on 8 December away at PSG in the group stage of the Champions League.